Involving people in project planning and development can help transportation agencies accelerate project delivery by identifying concerns early in the decision-making process. Virtual public involvement strategies can enhance traditional processes such as face-to-face meetings by addressing issues such as participants’ busy schedules, lack of diverse viewpoints, language barriers, and agency costs. In Every Day Counts round five (EDC-5), the Federal Highway Administration is helping agencies supplement face-to-face information sharing with virtual tools and strategies to make public involvement more accessible to more people. These tools offer convenient, efficient, and low-cost methods to inform the public, encourage participation, and get feedback. Agencies use mobile apps to share information about projects, particularly large or ongoing efforts. Apps reduce barriers to engagement by enabling individuals to participate from anywhere and offer comments as they experience the transportation system. An example is the Delaware Department of Transportation’s DelDOT App, which provides information on topics such as ongoing and upcoming projects. The app delivers real-time traffic alerts, notifies users of project-related public meetings, and provides a way for stakeholders to contact DelDOT when issues arise. Visualization employs tools such as 3D modeling, photos, and animations to illustrate proposed projects or various planning scenarios. Visualizations can be spread through a variety of media channels and can enhance live meetings. “It’s a lot easier for people to understand a project when they’re looking at a visualization as opposed to charts and maps,” said Petty. One agency using videos is the Utah Department of Transportation, which produced “DIY Video for Public Involvement” to explain its approach. These tools gather qualitative information from stakeholders and enable them to interact with voting or rating systems. The tools create a climate for conversation, allow for a larger volume of input over time, and reduce the burden of transcribing meetings or reviewing written submissions. Participating online or by telephone makes meetings more accessible to stakeholders. “People don’t need to be physically present to provide feedback on plans or projects, so it removes a common barrier to engagement,” said Petty. Virtual town halls can incorporate simulcasts to reach participants with limited English proficiency and live polling by touch-tone phone. When the Florida Department of Transportation combined virtual with in-person meetings on highway access changes, the agency improved participation and reduced public involvement costs on the projects by more than 50 percent. These web-based platforms display information in a familiar map format, allowing stakeholders to mark up areas of concern and suggest changes. Mapping tools can be paired with videos, narratives, and other digital information. This two-way communication technique saves staff time and reduces the administrative burden of collecting hard-copy public comment. These tools combine crowdsourcing, mapping, and survey functions in one tool. “They’re a one-stop-shop for informing the public about a project and engaging individuals through polls and surveys,” said Petty. The tools increase public participation by removing barriers to involvement and make it easy for agencies to manage public involvement on a single platform. Virtual tools such as tablets and other handheld devices add value to traditional public involvement. “They improve the quality of engagement at meetings, in part because every voice is heard, not just vocal participants,” said Petty. Agencies can use digital tools to bring project plans into communities, such as tech-equipped street teams to solicit live feedback from people. View an Innovation Spotlight video on virtual public involvement. Watch the EDC-5 virtual public involvement orientation webinar. Contact Scott Allen, Jody McCullough, or Harold Peaks of the FHWA office of Planning, Environment, and Realty for information and technical assistance. Bundling similar projects can produce cost savings because of economies of scale. Repeatable details and similar designs can save design and construction time, and bundling multiple projects can lower unit costs for materials. During Every Day Counts round five (EDC-5), the Federal Highway Administration is promoting an advanced approach to project bundling that saves State and local agencies 10 percent or more on construction costs, reduces months of delivery time and increases efficiency. Many transportation agencies use a basic form of project bundling to combine multiple preservation, rehabilitation, or replacement projects in a single contract. FHWA will help agencies take this familiar approach to a level of effectiveness not seen before, said David Unkefer, FHWA Resource Center construction and project management engineer and an EDC-5 deployment team leader. For example, bundled contracts may be procured with a variety of alternative contracting methods, many of which streamline preconstruction activities such as National Environmental Policy Act reviews and project design. A contract may cover one county or the entire State to address goals such as upgrading ramps to meet Americans With Disabilities Act standards, reducing rural roadway departures, or improving pedestrian safety. It may be tiered to allow a combination of work types, such as design, preservation, rehabilitation, or complete replacement. It may involve innovative construction techniques and financing tools. “An agency may also have a project bundling program, a series of bundling projects done strategically to achieve agency goals,” said Romeo Garcia, FHWA bridge and tunnel construction engineer and an EDC-5 team leader. Project bundling helps agencies maximize their resources, Unkefer said, citing a 2017 Indiana Department of Transportation study of 1,997 bridge projects in 715 contracts that found bundling achieved as much as 35 percent cost savings over individual contracts. The Pennsylvania Department of Transportation reported savings on a county bridge bundling program of up to 50 percent on design and 15 percent on construction. Bundling design and construction contracts also saves procurement time, leverages design expertise, achieves economies of scale, and helps keep critical transportation assets in good repair. ODOT used a stakeholder partnering approach, working closely with the County Engineers Association of Ohio and municipalities to advance the program. 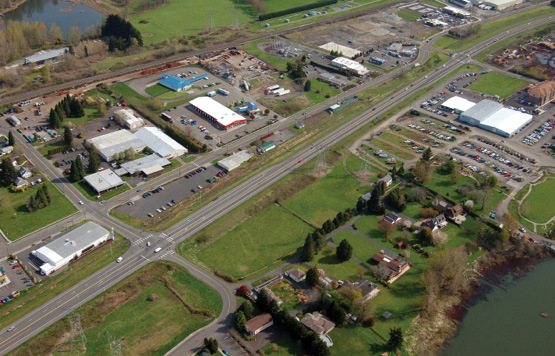 ODOT funded the program through $120 million in Federal Grant Anticipation Revenue Vehicle bonds and toll credits, so most local agencies had bridges improved at no cost to them. ODOT developed bundles for design and construction of the bridges to accommodate both large and small contractors. To maximize efficiency, most projects were completed under detours with simple construction techniques and minimal approach road work. Using bundling allowed the county to capitalize on geographic and project efficiencies by combining projects. “Some of the projects were close together, and several were very similar projects involving road widenings that included bridges,” said Hostetler. Other goals included hiring local contractors and stimulating the local economy. Build a coalition and outreach. Determine environmental review and preliminary design considerations. Conduct quality assurance and closeout. See FHWA’s Bundled Facilities Overview web page. Contact Romeo Garcia of the FHWA Office of Infrastructure or David Unkefer of the FHWA Resource Center for information and technical assistance. Visit the project bundling web page or contact the EDC-5 team for the “Bridge Bundling Guidebook,” a how-to manual on setting up a bundling program scheduled for publication this spring. In Every Day Counts round four (EDC-4), 19 State transportation agencies pursued strategies to streamline project delivery by integrating National Environmental Policy Act (NEPA) and permitting processes. These agencies worked with the EDC-4 team to improve coordination with resource and regulatory agencies and accelerate permitting timelines for projects that impact aquatic resources, historic and cultural sites, endangered species, and critical habitats. Of the 19 States the team assisted, 14 are developing implementation plans and working to improve integration of NEPA and permitting, and five are demonstrating best practices and assessing streamlined approaches. These States join an additional 15 States with institutionalized processes that have been used as models supporting this innovation. “Our approach is to help transportation and permitting agencies develop better working relationships, build trust, and establish formal coordination plans and agreements on permitting,” said Mike Ruth, Federal Highway Administration ecologist and leader of the EDC-4 team. Progress during EDC-4 included development of a programmatic agreement (PA) in Georgia, inception of a programmatic tool for culvert assessments in New York, and creation of a working group on wetland mitigation in Idaho. In Georgia, agencies teamed up to develop a PA to streamline project reviews under Section 106 of the National Historic Preservation Act. Section 106 requires agencies to consider the effects of federally funded projects on cultural and historic resources. The PA is expected to improve efficiency by providing a more predictable, transparent process for project review and consultation. The effort began in 2017 with a gathering of representatives from the Georgia Department of Transportation (GDOT), U.S. Army Corps of Engineers (USACE), Georgia State Historic Preservation Office, Advisory Council on Historic Preservation, and FHWA. The agencies convened monthly conference calls to draft the PA, with the EDC-4 team providing technical assistance. In early 2019, the agencies finalized the PA and held a workshop for agencies and tribes to review the new section 106 coordination process. As part of the effort, the EDC-4 team helped GDOT draft a Cultural Resources Manual to provide guidance on implementing the PA. 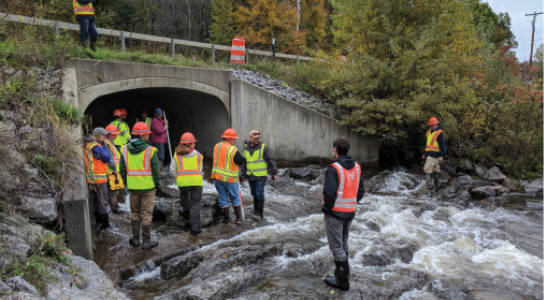 In New York, agencies are collaborating with the EDC-4 team to develop a PA and process for assessing culverts and bridges for aquatic organism passage (AOP) at highway-stream crossings. The New York State Department of Environmental Conservation (DEC) and USACE require that replaced, rehabilitated, and new stream crossings provide AOP, but New York does not have a standard method to assess crossings or barriers. This makes the permitting process inconsistent and time-consuming for both the New York State Department of Transportation (NYSDOT) and regulators. To address the issue, the EDC-4 team facilitated a 2018 workshop on the North Atlantic Aquatic Connectivity Collaborative (NAACC) method of assessing culverts and bridges for AOP. NAACC is a field-based method in which measurements such as water velocity and depth are plugged into an algorithm to produce a score indicating whether a crossing provides AOP. In the training, DEC and Nature Conservancy instructors showed participants from NYSDOT and USACE how to use the NAACC method to assess 10 bridges and culverts. 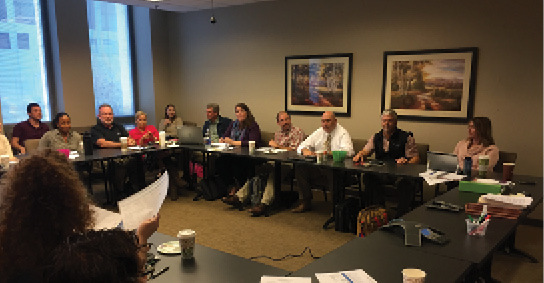 The EDC-4 team is now helping New York develop a PA establishing permitting procedures for highway-stream crossings based on NAACC scores and organizing a peer exchange with agencies from Maine and other States that have successfully implemented PAs. Mitigation for unavoidable impacts to aquatic resources is required to permit projects under Section 404(b) of the Clean Water Act. A 2008 USACE and the Environmental Protection Agency (EPA) rule establishes three compensatory mitigation mechanisms: in-lieu fee programs, mitigation banks, and permittee-responsible mitigation. In-lieu fee programs allow project sponsors to pay into a fund to support mitigation activities throughout an area rather than at a particular site. 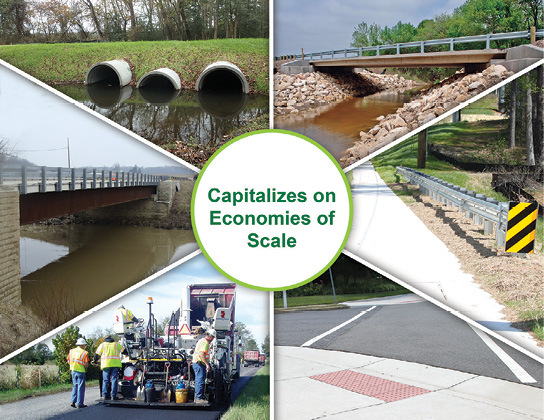 Mitigation banking involves restoring or enhancing streams and wetlands to offset the impact of highway projects in other areas. The EDC-4 team helped the Idaho Transportation Department (ITD) explore all three mechanisms and organized a 2018 peer exchange with ITD, FHWA, and the USACE Walla Walla District. The event included presentations by the South Dakota Department of Transportation, Los Angeles and Omaha USACE Districts, Bureau of Land Management (BLM), and EPA. The event enabled agencies with established mitigation programs to share best practices with ITD as it embarked on developing its own approach. After the workshop, the EDC-4 team helped agencies form the Idaho Mitigation Working Group, which is studying in-lieu fee and banking approaches. The group is also coordinating with BLM on potential use of Federal lands for compensatory mitigation. Contact Mike Ruth of the FHWA Office of Planning, Environment, and Realty for information and technical assistance. See the integrating NEPA and permitting library for case studies, webinars, and other resources. Technologies and practices promoted through the Every Day Counts (EDC) program support Federal Highway Administration priorities to enhance safety, improve infrastructure, deploy innovation, and serve the Nation efficiently and effectively. FHWA’s priorities are outlined in the 2019–2022 Strategic Plan, which adopts the U.S. Department of Transportation’s goals and aligns its strategic objectives and programs such as EDC with the department’s plan. The EDC initiative on data-driven safety analysis (DDSA), for example, includes crash and roadway data analysis tools that predict project safety impacts, enabling agencies to better target investments and reduce severe crashes. As a result of EDC, 10 States use DDSA as a standard practice and 37 are demonstrating and assessing DDSA tools. One is the Missouri Department of Transportation, which used DDSA to identify locations with high potential for safety improvement and apply cost-effective countermeasures expected to prevent 73 fatal and serious injury crashes over 10 years. Another safety strategy is the low-cost road diet, which reconfigures a roadway cross section to increase mobility and safely accommodate all users. Road diets are a standard practice in 22 States and 25 are installing road diets and developing processes for identifying potential roadway reconfiguration sites. After the Virginia Department of Transportation completed two road diets in Fairfax County, crashes on those streets declined by 67 and 69 percent. The geosynthetic reinforced soil-integrated bridge system (GRS-IBS) is an infrastructure technology that delivers low-cost, durable structures that can be built quickly with readily available equipment and materials. Aided by promotion through EDC, the number of GRS-IBS structures in the United States grew from a few in 2010 to more than 200 today. Eleven states use GRS-IBS as a standard practice. An Accelerated Innovation Deployment (AID) Demonstration project in Dodge County, WI, replaced two bridges over streams, demonstrating the feasibility of GRS-IBS for water crossings. The project highlighted the system’s resilience when flooding of a cofferdam during construction immersed a half-finished abutment, but no damage occurred to the constructed section. Another EDC innovation, ultra-high performance concrete (UHPC) creates simple, strong, durable connections for prefabricated bridge elements. UHPC has been used on more than 140 U.S. bridges. Seven States institutionalized UHPC connections and 23 are demonstrating and assessing the technology. In addition to connections, UHPC can be used for durable bridge deck overlays, as shown on an AID Demonstration project in New Castle County, DE. The e-Construction innovation uses digital technologies to improve construction document management, saving time and money and enhancing communication. As a result of EDC, nearly every State is developing plans for, demonstrating, or assessing e-Construction tools or using them as a standard practice. The Idaho Transportation Department (ITD) institutionalized the use of collaboration software for project-level electronic document management. ITD shared the software with the Local Highway Technical Assistance Council and local agencies. Three-dimensional (3D) engineered models help agencies more effectively complete project design and construction, visualize projects for public communication, improve schedule and cost management, and create accurate as-built records. Thirty States are implementing 3D modeling and planning to make it a standard practice. Six States institutionalized the practice. The Utah Department of Transportation is piloting construction contracts using 3D models to replace two-dimensional plan sets, enabling significant improvements with digital project delivery and construction automation. To enhance accountability, agencies are integrating National Environmental Policy Act (NEPA) and permitting processes to synchronize agency environmental and permitting reviews and save time and money on projects. Nineteen States are developing implementation plans or demonstrating and assessing integration tools. Fifteen made it a standard practice. The South Carolina Department of Transportation is developing merger agreements for Clean Water Act permitting to shorten project delivery and improve environmental outcomes. Agencies and planning groups are using regional models of cooperation to coordinate planning across jurisdictional boundaries to reduce congestion and deliver projects faster. Use of regional planning to address transportation issues is a standard practice in 20 States, and sharing data models and tools is institutionalized in 18 States. Arizona agencies established the Joint Planning Advisory Council to enhance coordination on planning and economic issues in the fast-growing Sun Corridor. With e-Construction technology, the Rhode Island Department of Transportation (RIDOT) is saving time and enhancing partnering on the Route 6/10 interchange reconstruction project, the largest design-build project in agency history. RIDOT is using an electronic plan (e-plan) system for document management to handle the high volume of documents associated with design-build projects. The e-plan system provides a collaborative environment that enables the project team to access documents simultaneously. As a result, RIDOT expects to significantly reduce the amount of time spent on reviews. Located west of downtown Providence, the Route 6/10 interchange serves as an east-west link for traffic on Interstates 295, 95, and 195. Drivers make nearly 100,000 trips a day through the interchange. The 5-year, $410 million project will rebuild the interchange while replacing or removing seven structurally deficient bridges. The project will also improve bridges serving nearby streets, construct a flyover bridge from Route 10 north to Route 6 west to enhance traffic flow, and add bicycle and pedestrian paths. In design-build contracting, the design process is scheduled in phases, allowing the builder to start work on that phase. RIDOT chose design-build contracting for the Route 6/10 project so that construction could begin before the final design was completed. Seven firms on the design-build team are executing a design effort expected to involve 150 submissions. In the past, a design-build team printed at least 10 sets of plans for each submission. The RIDOT project manager distributed the plans to internal and external reviewers (some by mail), compiled written comments, and sent the comments to the design-build team. On the Route 6/10 project, RIDOT is using a software application that allows document review on a collaborative website. After the project manager uploads a design document, multiple team members can mark up the document concurrently, making comments directly on the PDF. These electronic submissions offer benefits such as faster delivery, activity tracking, no printing costs, and ease of coordination. 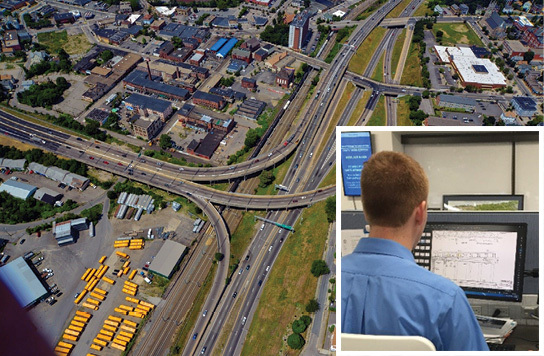 The Federal Highway Administration Rhode Island Division partners with RIDOT on the project and conducts real-time electronic reviews of design documents with the RIDOT team. The e-plan system enhances document tracking and increases transparency between the agencies, said Anthony Palombo, division area engineer. “This process provides a better foundation to improve communication and collaboration by providing consistent access to up-to-date versions of documents and the ability to track submittals, requests for information, requests for changes, and all project materials,” Palombo said. Contact Deirdre Paiva of RIDOT or Anthony Palombo of the FHWA Rhode Island Division. Drivers on a busy route in Pima County, AZ, are benefiting from adaptive signal control technology (ASCT), which adjusts traffic signal timing based on how many vehicles are on the road. The Arizona Department of Transportation (ADOT) installed an ASCT system on State Route 77, a north-south route connecting Tucson and Oro Valley. As a result, travel times over an 8.5-mile section of the road have been reduced by about 10 percent—about 2 minutes off the morning southbound commute. Northbound travel times have improved by 1 minute during the afternoon commute and as much as 3 minutes earlier in the day. The Colorado Department of Transportation (CDOT) saved millions in 2018 by using two-dimensional (2D) hydraulic modeling instead of traditional one-dimensional (1D) models. 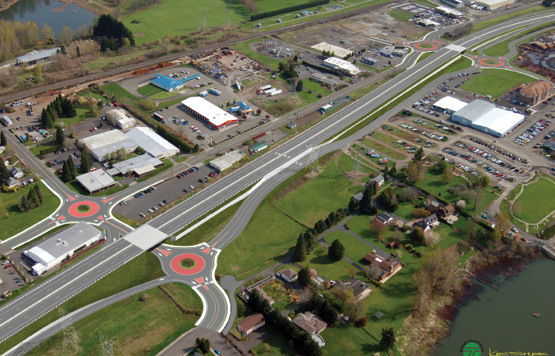 On a State Highway 144 project, using 2D modeling accelerated the scoping process by months and saved $2 million, compared to the cost of a 1D model. On a State Highway 55 project, 2D modeling helped CDOT more accurately calculate how the South Platte River was pushing against an abutment and develop a protection solution that reduced construction costs by $1.8 million. A 2D model created for a U.S. Highway 287 project allowed CDOT to save $300,000 in material costs by reducing the size of riprap originally proposed. On a project to retrofit structures at six South Platte River crossings, 2D modeling helped CDOT optimize the structures for scour protection while saving $500,000 on materials. The Idaho Transportation Department (ITD) joins the New York and Pennsylvania Departments of Transportation as a prominent champion of deploying ultra-high performance concrete (UHPC) connections for prefabricated bridge elements. Since 2016, the agency has completed construction on 20 bridges that use UHPC connections. In particular, ITD is advancing the use of UHPC to connect adjacent members, such as precast voided slab beams and deck bulb-tee girders. See the Federal Highway Administration UHPC deployment web page to learn more about the use of UHPC in more than 200 bridges across the United States. 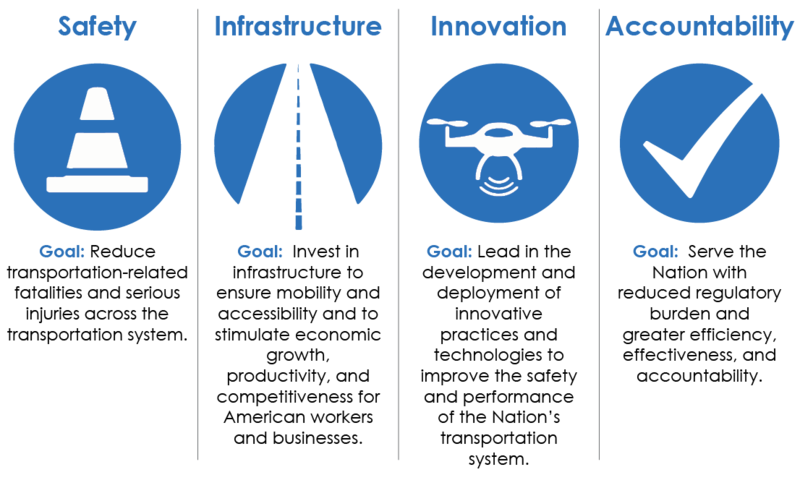 Use the Center for Accelerating Innovation’s (CAI) State Innovation Accomplishments map to learn how transportation agencies across the country are advancing new technologies and practices. CAI will continue to update this resource with more success stories as States deploy innovations in Every Day Counts round five in 2019 and 2020.